KαN® is a Nitrogen fertiliser based on urea, treated with AGROTAIN stabiliser. AGROTAIN reduces volatilisation to ensure that the Nitrogen is available to fuel crop growth all season long. Generally, KαN® costs less per unit of Nitrogen compared to CAN. This helps to save you money on your Nitrogen fertiliser inputs. KαN® has a high Nitrogen concentration with 70% more N than CAN. This means you have less haulage, storage and reduced product to spread, saving you time, fuel and money. KαN® (Agrotain) has been independently trialled by Teagasc under both grassland & tillage. The trial results show that KαN® yields are consistently as good as CAN, if not slightly better. Teagasc, in conjunction with AFBI, have carried out independent trials on grassland and tillage over 3 different seasons. 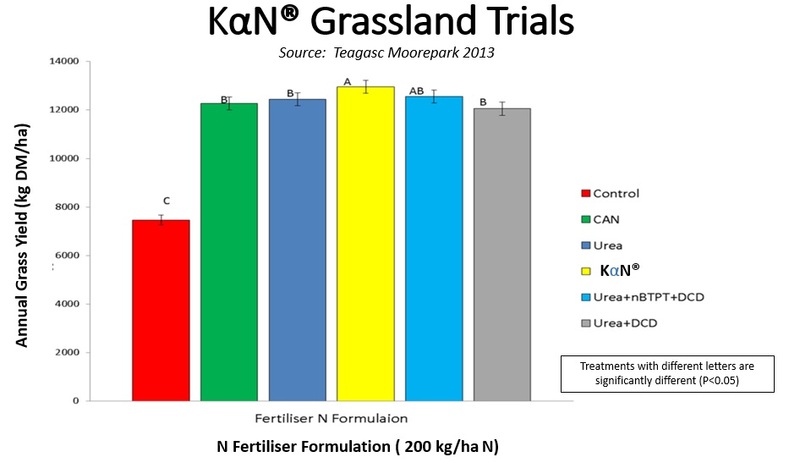 KαN® has performed consistently as good as, if not better than CAN or Urea throughout the trial duration. Where can I get KαN®?